The Twin in Berlin: The Prayer Was Indeed a Conversation With Our Heavenly Father. The Prayer Was Indeed a Conversation With Our Heavenly Father. Greetings from Germany, land of VWs and stick shift drivers. HELLO, I'm stoked to be writing this email today. Life is good. The second session of last Sunday's conference was AWESOME! Uh... Elder Bednar's talk? To say it was fantastic would be an understatement. I think every missionary in the world watching conference with an investigator was going crazy, I know I was. He perfectly described why we all, missionaries and members alike, share our beliefs. Cool, cool. My bag broke. Yep, that strap just came right off. But LUCKILY it was right outside our apartment. I was about ready to cry, as it was already a tough day for me. But alas, I digress. Let's get to the good stuff, investigators. Wait, I will answer some of your questions first. Best thing, we'll get there. Most "challenging" thing? hahaha nice try mom. This Sister is on top of the world 24/7. Okay now that we've all stopped laughing...I would have to say appointments falling out and just feeling tired. I'm trying to get better at shaking off the negative feelings that come naturally when things just seem.... lame. Welcome to talking about the teaching pool, where the souls are important and the numbers don't matter. Hope that made somebody smile. R! We met with her at our Bishop's house, but just his wife was there. She served a mission in the Leeds Mission, so we all just talked in English. R is form Ghana, did I say that? We talked about the importance of church attendance, and renewing baptismal covenants. Schwester Glandorff asked R some straight up and simple questions about her hesitations in regards to baptism. She is continuing to pray about it. She LOVED conference, and felt the spirit very strongly. I love R so much, she has such a testimony of God and our Savior. 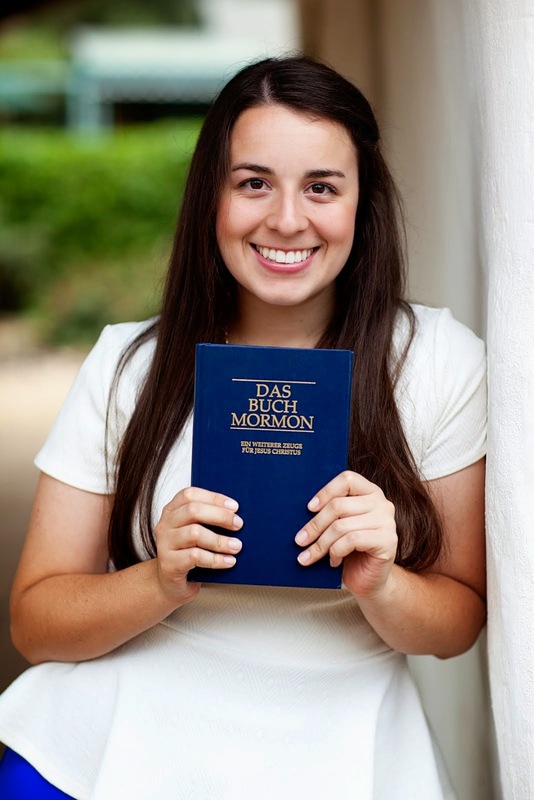 She is very connected to her baptism that she had in the church that helped her with her own conversion process. We continue to love and pray for her. She would just fit in perfectly as she is. < I can see that she is so prepared!! Agency can be hard to deal with, if you know what I mean. S is a really smart dude who knows a lot of different things about religions. He talks a lot, which can be hard, as we get off subject often. We have been trying to help him develop faith in Jesus Christ, but it's a process. The Gospel of Jesus Christ is so simple, that's why it confounds people! We have our assistant gml come with us as a joint teach. S listens more now I have noticed he is really friendly and polite. I just want to help him so much!!! B!!!! I love B so much. He is form Turkey, and speaks German with us. He is sooo precious and funny! So he needs a job, and is not enjoying Germany too much, so he thinks he will have to leave either this week or in the next two weeks. So we meet with him at the church, in the chapel. We had taught him how to pray in the name of Christ before, and he said he had been doing that, but that he doesn't really expect anything from Heavenly Father. He knows He is important and loves us, but he wasn't so sure about prayer. The next night during our nightly prayer, I had the thought we should send him a quick text to let him know we were praying for him, and that Heavenly Father loves us. So we did. We got a funny little text back. He said he was glad, and that that night before he went to bed he would pray. THAT'S WHAT IS UP. The spirit is real, my friends. Here comes the best thing of the week. We met with him the next day in the chapel again, and he said he wanted to pray for us, he just didn't know what to say. After minutes of silence, B just started to pray! Out loud! This was the first time that he had ever said the prayer himself with us! I was so OVERJOYED. I can't even describe how happy I was in that moment. We had taught him to fish for himself in a way! The prayer was indeed a conversation with our Heavenly Father. It was awesome, AWESOME!!! That's not everybody, but I’m sending a letter sooonish to let you know the info. Next week ill try to be a little less thorough for each person so I can talk about more people. But I just love all the people we teach so much! There is so much to say!! Ya didn't think this email would be so full did you. Well so I've talked about half of the subject of this email. b!! Now for buns. So Elder Carpenter, our fearless district leader, and I were talking during the daily call. At the very end of the conversation he asked if Sister Norton and I had agreed on our favorite baptism song yet. (an investigator of the Elders is getting baptized this week!! B, from Nigeria!!) I said not yet...and then he said that we would be giving a musical number at the baptism, and he had already told B that we would love to do it, and how B thought that was really nice. MENSCHENKINDER as Elder Carpenter always says. laaame. hahaha oh man not sure if that's really what happened or not, all I know is that the tricky elder carpenter somehow committed us to singing. After I had already hung up, I thought, he should totally do something for us too! natürlich, right? Someone had said something a while ago about him making really good cinnabuns.... sooo I called right back and said he had to do us a favor in return. He was hesitant but slightly agreed. When I said make us cinnamon rolls, he didn't even hesitate before saying yes. hahahaha and he brought them to us the NEXT DAY!!! THEY WERE SOOOOO GOOOEY AND GOOOOD AND DELICIOUS!!!! Thanks for all the emails, sorry I couldn't answer them all! I love you all, I love Father in Heaven, and I love my Savior Jesus Christ. This life is a precious gift. This time on Earth is so valuable and important. Let us realize what we need to do, and do it. Let's never forget why we are here, and who sent us. Most importantly, let's not forget to where we want to return someday.